Andy and Jane Gibbs welcome you to our Bowden Lodge website. Reviews. The reviews below are genuine reviews taken from Expedia. We have only included the most recent reviews, but you can view all the reviews yourself on the Expedia website. Please see ‘Trip Advisor’ reviews by going to the link on ‘News’ page on this website. 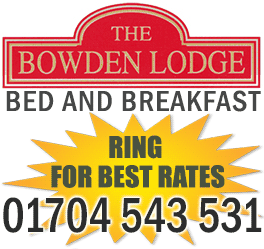 The Bowden Lodge is a family-run guest house and B&B in a quiet central location close to Southport's famous Lord Street. The promenade, central attractions, and the Southport Theatre & Convention Centre are also just a short stroll away from this Southport bed and breakfast. Our accommodation is provided on bed and breakfast terms and is very favourably priced compared to local prices in the area. We have been awarded four stars by the AA in their guest accommodation rating scheme and have a Five Star rating on trip advisor. These awards recognise that our guest house’s high standards in terms of cleanliness, service, bedroom comfort, bathroom facilities and food standards. The Bowden Lodge retains all the charm and atmosphere of a Victorian family home and accommodation is of a high standard. We provide a personal, friendly and homely service and good food, comfort and cleanliness are assured. We have a policy of continuous refurbishment to maintain, and improve upon our high standards. For business or pleasure, Southport is an ideal location, with easy access to Liverpool, Merseyside, Manchester and all major North West towns and attractions. The railway station is a short walk away from our B&B and there are also regular bus services to Liverpool, Chester, Preston and Blackpool. Please enquire about the “Bowden Lodge Preference Card” which gives our guests generous discounts on food and drinks in five independent local restaurants.